Thomas and Sally, sitting in a kookaburra tree. Image courtesy of Y&R/B&B Soaps Facebook page. The “Bold and the Beautiful” cast trip to film episodes in Australia to air in honor of the show’s anniversary just got more intriguing. 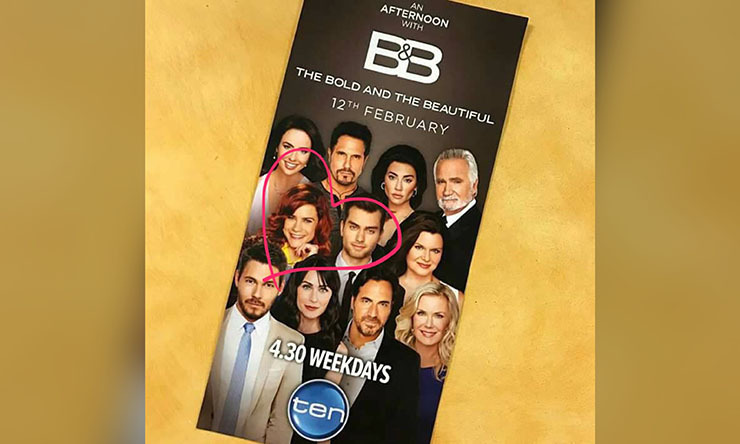 Soap Cities (SC) recently brought you the news that a bunch of fan faves from “Bold and the Beautiful” were headed down to Australia. They’re filming a special episode arc in commemoration of the CBS sudser’s 30th anniversary. Based on social media posts over the last two weeks, our original impression, which we conveyed to you, dear readers, was that a select group from LA’s most glamorous bunch were going to Australia. This group included: Ashleigh Brewer (Ivy Forrester), John McCook (Eric Forrester), Jacqueline MacInnes Wood (Steffy Forrester), Rena Sofer (Quinn Fuller Forrester), Heather Tom (Katie Logan), Scott Clifton (Liam Spencer), Thorsten Kaye (Ridge Forrester), and Katherine Kelly Lang (Brooke Logan). Now we see this fab bunch is also doing a fan event in Australia, a country in which they enjoy a wild popularity. It’s possible Fode and Hope are there solely for the fan event. But we think they may have another purpose for tagging along with their cast members. They could be part of the episode arc the others are filming. We had guessed that the Australian episodes might center on a Liam/Steffy wedding, which would explain Darin Brooks’ (Wyatt Spencer) absence. But now Fode and Hope’s inclusion in the Aussie awesomeness has us rethinking our original idea. This budding on-screen couple might be in two to cause trouble for the the other cast members! What do you think, SC readers? Next Article SOAP CITIES EXCLUSIVE: Surprise Guest at Howarth/Easton Fan Event Last Night!